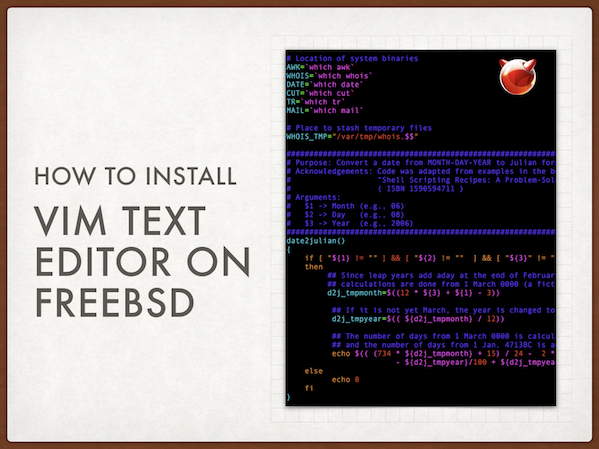 User Vivek Gite is at it again with another tutorial, this time showing us how to install VIM text editor on FreeBSD. VIM is a powerful command line text editor available on many open source platforms. You may view the full set of instructions at the link below. Introduction: VIM (Vi IMproved ) is not installed by default under FreeBSD. Vim is a text editor that is upwards compatible to Vi. It can be used to edit all kinds of plain text. It is especially useful for editing programs or config files. You can install vim binary package system or use FreeBSD’s ports system.